This is a contact-type 3D scanner. Philippe "Philo" Hurbain (co-author of "Extreme NXT", a book about advanced Lego robotics) made it to help him import odd-shaped Lego parts into the LDraw Lego-CAD program. As you may have noticed, the scanner is itself made out of Lego. I think the only non-Lego parts in it are the actual needle that prods the thing being scanned, and one extra-flexible cable going to a standard NXT light sensor. All the rest - drive components, sensors, you name it - is 100% Lego. The brain is Mindstorms NXT. Hurbain has made various add-on sensors for Lego robots, but I don't think he's used any of them in this. Apparently, the new linear-actuator parts are accurate enough for this job, when you drive them with one of the NXT motors, which have built-in position encoders. More info on Philo's site. 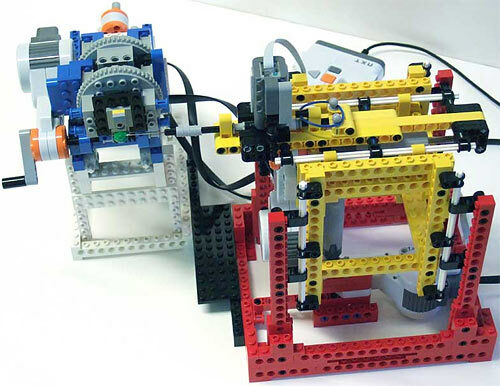 OK, now combine a 3D Lego scanner with a decent 3D printer and you have infinite Lego. Such thoughts make me smile. 3d lego scanner+3d lego printer= lego apocalypse as the world is devoured by self replicating legos. Ooh! A lathe and a milling machine (CNC controlled of course) to create clay moulds. Bake in a kiln (or home oven), then pour your thermoplastic in. Once you have the hang of soft plastic, try moving up to brass. Your next assignment: a working steam engine, driving a hand-wound alternator. Lego scanner... Lego printer... self-replicating Lego tribbles! In theory it's in fact pretty close to a scanning tunnelling microscope! What about using your 3D scanner and printer to bootstrap smaller components? If you took the laser from a (multi layer) DVD player, could you use feedback from the focus to get depth data? If it was mounted on the tip of a 15cm pole (for example) could you combine a large gear movement at the far end, with a smaller movement (or even a pivot point) near the laser, to produce scans of a Very Small Area?